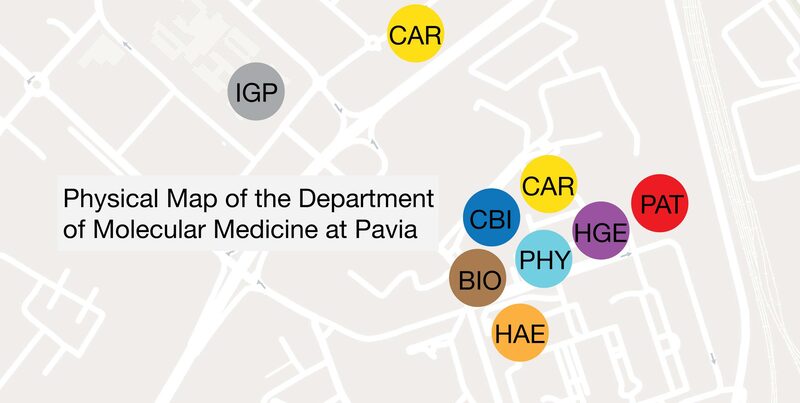 The Department of Molecular Medicine, and many other Departments currently active at the University of Pavia, was born at the end of 2011 from the assembly of 9 earlier (smaller) Departments or Institutes that had been in existence for a number of decades (Biochemistry, Physiology, Immunology and General Pathology, Human Genetics, Clinical Biochemistry, Pathology, Cardiology, Haematology and Respiratory Diseases). Two further points are relevant in order understand the genesis and logistics of the Department: (i) in Pavia and in other Italian Universities, members of the same academic disciplines are scattered in different Departments, (ii) one of the key components of the Department, namely the former Institute of Repiratory Diseases, migrated to another Department in 2015 following the death of Prof M Luisetti, the Head of Respiratory Diseases. – the Units of Haematology (HAE), Clinical Biochemistry (CBI) and part of the Unit of Cardiology (CAR) are housed in premises belonging to the Fondazione Policlinico San Matteo. The remaining part of the Unit of Cardiology is housed in buildings belonging to Fondazione Salvatore Maugeri, a private hospital. – the Units of Biochemistry (BIO), Physiology (PHY), Human Genetics (HGE) and Pathology (PAT) are housed in dedicated University buildings built in the 1950s in via ….. (biochemistry) or in via Forlanini (Physiology, Human Genetics and Pathology). – the Unit of Immunology and General Pathology (IGP) is housed in a new teaching and research building known as the Golgi/Spallanzani Institute that opened in 2009/10. The mosaic structure of the Department is not conducive to the establishment of research projects and programmes involving multiple Units. Further, the premises available to several Units do not offer high-quality laboratory space for future expansion. The Department is seeking to address these limitations by acquiring extra, communal space in which central facilities and new collaborative projects and programmes may be housed in future years.